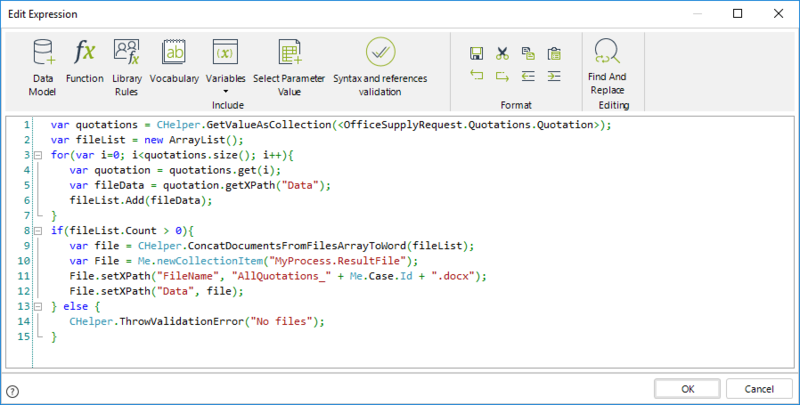 This section describes how to use the feature to concatenate documents from a files array. In the following sample process, assume we have a process entity called OfficeSupplyRequest. We want the attribute Request Summary to have all the documents uploaded to the Quotations collection. To do so we will use the Concatenate documents from files array method. The documents to concatenate should be the same format, either PDF or Microsoft Word document. Otherwise, the method will not work correctly. •The filesArray: the array of File data to be concatenated. The resulting file will have as name AllQuotations_[CaseNumber].docx. Please make sure the file extension matches the document type the method uses. The resulting file will have as name AllQuotations_[CaseNumber].pdf.